In late November 2009, I received a letter notifying me of the United Nations and its subsidiary’s program to take place between 3rd and 5th December, 2009 at Port-Harcourt, Nigeria. The time of notice was too short for me to inform you officially. Before now, I have always been participating actively in services to humanity with much dedication to universal moral values, teaching on an ideal family living, inter-religious cooperation, and International harmony that are in line with the United Nations goals and exemplifying the peaceful co-existence in deeds and words without any barriers. I have been involved in paper presentations, as a resource person, facilitator and other different capacity in helping the less privilege, and as the African Representative of Healing Hands International and Hope Spring, that are solely humanitarian based NGOs. Our activities are of great benefits to humanity especially in the Sub-Sahara African Countries. So I honored the nomination to participate in this year’s program only to be informed at the beginning of the event that I am the nominee for the Ambassadorship award. I was humbled, as I did not know that our services has gain so much publicity even to be nominated in the mist of people who are of different faith with us. The program featured a three day capacity building on character development, community service, conflict resolution and peace building in commemoration of the United Nations International Volunteer Day 2009. At the end of the program, the nominees with outstanding qualities of selfless service to humanity were being honored after being carefully screened for personal qualities, organizational contributions and the overall impact to the development of humanity. 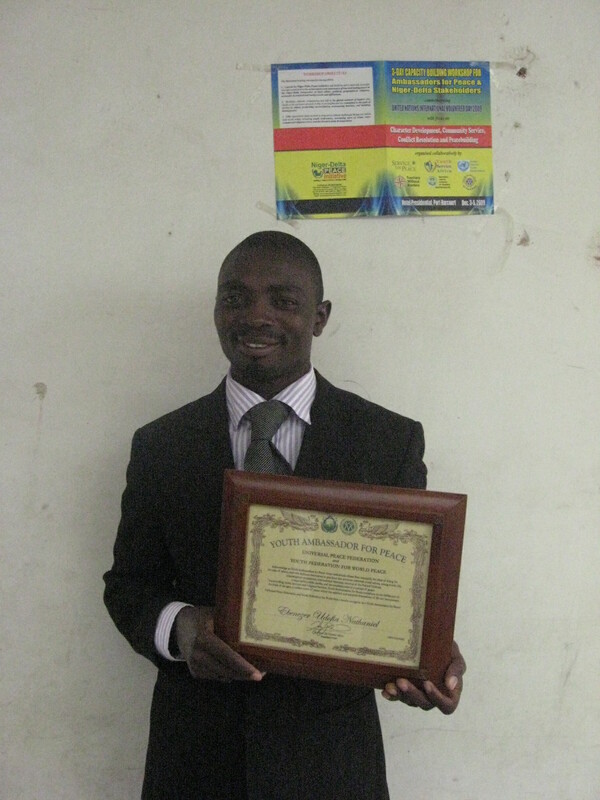 I found myself standing in front of a large crowd of people holding the citation of honor and being commissioned as the AMBASSADOR FOR PEACE by the Universal Peace Federation and Youth Federation for World Peace on Saturday, December 5th, 2009. This is a challenge and a call to service, recognition of our existence and contribution, and a commission to provide more services. May all glory be to God. Categories: 27642134 | Tags: Award | Permalink.